Patient users who are willing to restart the mapping app can get it working on an Android device. "You can tell it's still a thing in the making," he said. "Aruba is working on it." In addition, a weakness in a Wi-Fi zone can cause tracking problems. In big buildings with dense walls, a GPS signal will be difficult or impossible to get, and sometimes the cell-phone coverage indoors is poor and can't provide location data to replace the lack of GPS. "A combination of bad Wi-Fi and a thick building -– that's old school," he said. 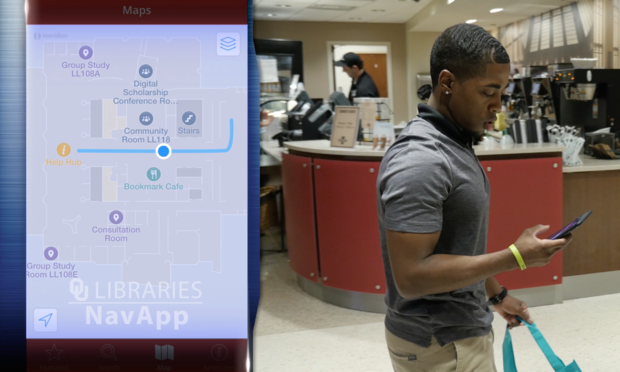 A University of Oklahoma student checks his smartphone using beacon technology to find his way around the university's library. Aruba prides itself on working with Wi-Fi access points from various vendors.The university has hundreds of Cisco Wi-Fi access points campuswide that can work with the Aruba technology. Cook wouldn't divulge the university's total cost of the beacon system with the related Meridian software and sensors, but said that the software for the customized turn-by-turn Aruba application was "very affordable" compared to what it would have cost to develop it from scratch. Aruba said the new sensors will cost $195 apiece, and its beacons cost about $75 apiece. Meridian software pricing varies based on the deployment. Aruba introduced beacons and related software in November 2014 and has other customers — some with many hundreds of installed beacons-- including Levi's Stadium in Santa Clara, Calif., and Orlando International Airport. It would take about 1,000 beacons to cover an auditorium or a field like Levi's Stadium, at a list price of $75,000; an added 100 sensors would cost $19,500, Aruba said. Privacy with the beacon technology isn't a concern, Cook said. The university's servers grab data showing where smartphone users have been in relationship to beacons, but the information kept on those servers is not available in real time and not specific to any single user, he said. If a bad guy wanted to use sniffer technology to follow a user with a smartphone by relying on a beacon, that would be impossible, Cook said, because the beacons chirp outward and don't collect incoming information on who is using a beacon. Aruba said it can perform beacon configuration changes remotely, and that's done through an encrypted channel. Despite reports that Apple's iBeacon technology hasn't grown as quickly as expected, there are still optimistic projections for use of beacons overall. "Today, the number of beacons [shipped] remains quite small, but in terms of device shipments, we are forecasting over 3 million globally in 2015," said Patrick Connolly, an analyst at ABI Research. He predicted that 3 million figure will double in 2016. There are already hundreds of companies selling beacons, Connolly said; ABI ranks Aruba as one of the top 25 in indoor location technology. Competitors include Cisco, Ruckus Wireless and Zebra for networking elements, and even Facebook and WeChat for apps. While Connolly described the indoor and proximity location market vendor ecosystem as "huge," he said that retailers have been "rightly very cautious" about deployments. Beacons will be used in large schools, hospitals, airports and smart cities, as well as retail locations, he predicted. "Despite recent media reports, the market is actually outperforming our initial forecasts," Connolly added. "We expect to see many winners across different vertical and regions. Indoor location is a utility just like electricity or heating and likewise will become commonplace everywhere. It is a huge greenfield space and the land grab is on." Aruba can benefit from its status as a unit within HP, Connolly said. Customers already running HP servers could use beacons to help staff members find available meeting rooms in large corporate buildings, for example. IDC analyst Rohit Mehra said an IDC survey shows that 40% of a few key industries plan to expand the use of Bluetooth Low Energy beacons for location-based services (LBS) in one to two years. However, institutions like OU won't necessarily be big players with beacons, he predicted. "Where the rubber meets the road, where beacons provide real value, will be in retail, hospitality, public venues like stadiums and in transportation and logistics," he said. The ultimate success of beacons will rely on a combination of Bluetooth beacons in a network that also includes Wi-Fi, he said. "To manage beacons, you need a Wi-Fi infrastructure. "My view is that we have gone through some kind of illusion initially in terms of the rapid or explosive growth of Bluetooth Low Energy beacons," Mehra said.